Guyi factory has released this fine Pu-erh cakes tea set since 2008, composed of 5 cakes raw Pu-erh and 5 cakes ripe Pu-erh, handsomely wrapped in a box, one cake weighs approximate 200 grams. 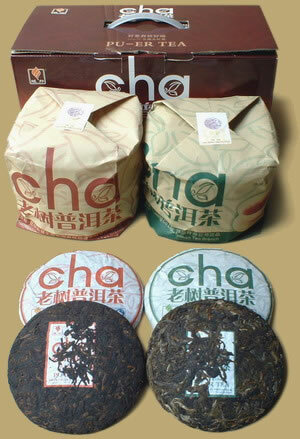 The factory has selected high quality tea leaves from Mengku for raw cakes, and selected tea leaves from Menghai for ripe cakes. An excellent candidate for newcomers, or a great gift for a friend.